Last week, we had the pleasure of visiting Josh and Jodi (and their ADORABLE boys) and sharing Thanksgiving dinner with them. I still can't believe that we met because of our blogs! Jodi is in to thrifting and finding vintage clothing. She then posts them on her clothing site Token. One of the neatest things is that Jodi uses a large portion of her proceeds to give away to charity. When we met, she let me peruse her closet where all of the clothes are neatly stored, and she gave me a few items. Jodi gave me this cute blouse, inspired me to wear the boots, and my no heat curly hair method was something she shared on her site too. Thank you, friend! 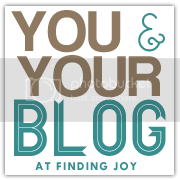 On a side note, I found a wonderful site called Finding Joy and Rachel had a great link-up. She thought it would be a good idea to take a picture of You and Your Blog. My blog is my virutal home-away-from-home. A place where I journal my life, so of course I loved this idea. The weather in Sacramento has been really weird the past few weeks, hence the backyard fogginess. If you have a blog, you should link up too!